Most people would rather keep bees at bay, but Steve Hanlin, entomologist with the US Department of Agriculture research station in Ames, Iowa, understands their value as pollinators. To Steve, bees and other pollinators have a multi-billion dollar impact on what we eat and wear. Steve spoke at Sunday’s Honey Fest at the Indian Creek Nature Center. His mention of Osmia bees was met with a round of applause by some of the beekeepers in the audience. That type of bee, also known as the Mason bee, does not sting. The USDA mostly uses honey bees for their pollination of heirloom crops, which are raised by staff in Ames, but Steve called the bumblebee the “best wild pollinator there is.” The cost of bumblebees is more prohibitive, so they’re not used as often by his group. For people with apple orchards or other plants in need of pollination, Steve said it’s best to not spray weed beds and to not use a rototiller. Both destroy habitats where bees like to live. Old mouse nests are an ideal spot for bumblebees, but encouraging mice to live nearby raises its own questions. Basically, bumblebees live in undisturbed sandy soil. 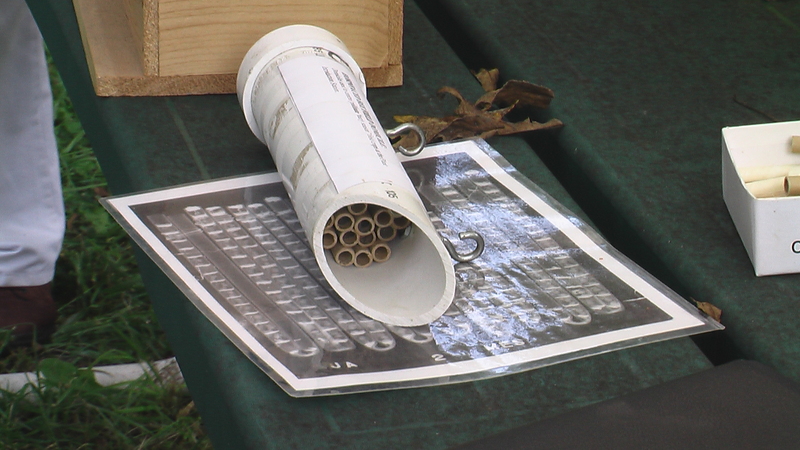 Steve said osmia bees can be attracted by placing cardboard straws in an empty Pringles can where the bees can live. Plastic straws don’t work, as the bees would suffocate. The cardboard straws are what mail-order bees are shipped in, he said. Another “bee house” can be seen in the photo above. As an aside, Steve said moths also pollinate, but only night-blooming plants. Also, some types of cactus are endangered because their pollinators, bats, are declining in number. Honeybees don’t pollinate trumpet-style flowers, he said, and while bumblebees make little “honey pots” Steve doubts that people who buy bumblebee honey are getting the real thing. The honey, produced in tiny quantities, would have to be extracted by micro-pipette, he said. If you’re looking for an outdoor activity on this beautiful day, and you’re reading this Sunday (Sept. 21) there’s still time to make it to the 10th Annual Honey Fest at the Indian Creek Nature Center in Cedar Rapids. The festival runs 1-4 p.m. at the Nature Center at 6665 Otis Rd. SE. Cost is $2 per person, or free for children under 3. Nature Center staff note that honey is a sweet reason to appreciate bees, but pollination is their most important job. You can learn more about the importance of bees in pollinating your plants and more at the festival. Enjoy bee crafts and games, taste food made with honey, see how honey is extracted, enjoy music, and watch in wonder as a beekeeper dons a “beard” of live bees!